Now that most of The CW series have wrapped up for the season, I’m going to go through and analyze the shows for various things like best individual issue, comparing big bads, main character arcs, etc. Kicking it off with best new character, now visiting the Waverider for DC’s Legends of Tomorrow. There are so many interesting choices for best new character depending on your definition of “new”. John Constantine and Kid Flash are new to the series, but not new to the Arrowverse. John Noble has to chances on the list playing both Mallus and himself. Blackbeard, Helen of Troy and Julius Caesar were all interesting but only around for a few episodes. And, of course, there are Kuasa and Nora Darhk to consider. But the obvious choice should be Zari Tomaz, played by Tala Ashe, the Legends version of Isis. It took a while for me to warm up to Zari. Okay — to be honest, I really didn’t like the character until they got to the time loop episode called, ‘Here I Go Again’. She never tried to fit in prior to that, and even afterwards she seemed distant. I think the character needs to be a bit more developed in the next season to really make her click. Now, you might be asking, if she isn’t the best new character, then who is? Isn’t that obvious? Beebo, of course. DC’s Legends of Tomorrow — Photo: Dean Buscher/The CW — © 2017 The CW Network, LLC. All Rights Reserved. Who knew that a little blue Tickle Me Elmo knock-off would end up being so important to the series? Okay, Phil Klemmer and the other writers knew, but I mean, who outside of the writer’s room? He was a funny gag as part of the ‘Beebo, the God of War’ episode and a great example of why this show is great. But then he kept appearing on socks and shelves and even on The Flash. 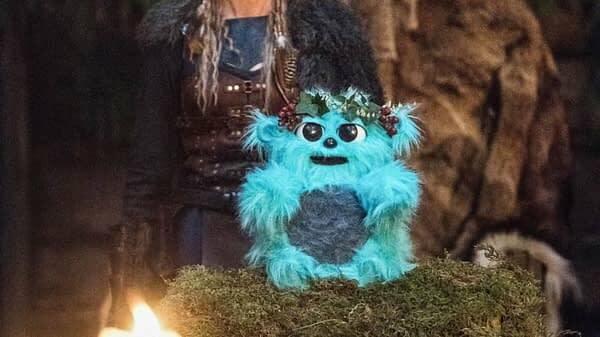 It was obvious that the show was going to use this little blue-plush character as much as they could, and for a while I thought that Mallus’s final form was going to be Beebo. Boy was I wrong. The Captain Planet / Ghostbusters style finale fight between a giant stuffed Beebo and the large, winged demon Mallus may have been the best five minutes of the entire Arrowverse this season. It was definitely the best use of a CGI budget ever. And the fact that there are no Beebo toys available at this very moment is a national tragedy. Here’s hoping for more of our furry blue friend in season 4.